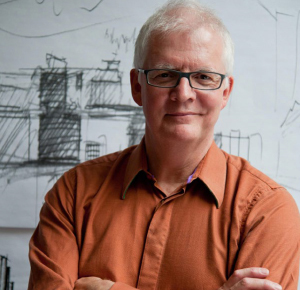 Founded in 2004 by Ken Shuttleworth, Make have rapidly established themselves as a serious commercial practice with a number of remarkable buildings around the world. Their schemes include a striking gold apartment building in London’s Fitzrovia, the tiny, expressionistic Information Centre near St Paul’s Cathedral in the City of London, the huge Cube building in Birmingham and the equally large 5 Broadgate in London. Make collaborated with izé on 55 Baker Street, a rebuilding of a post-war commercial structure which was revivified through a faceted glazed insertion to create a new lobby and atrium. The Flamingo handles and hardware were designed to reflect and refract the angular planes of the architecture so that the macro scale of the new intervention would be picked up in the micro scale of the physical connection with the building. Make’s other range deals with a tectonic language completely stripped down to the orthogonal: clean, clear and sharp.